I agree with the item being a plum bob. We found one very similar when I was stationed at Charleston Naval Weapons Station in the 70's. 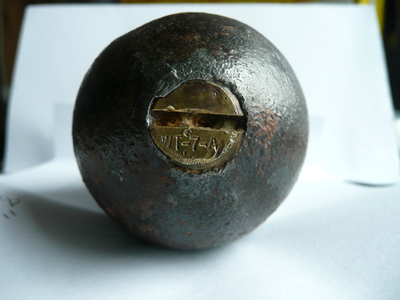 We threw it in the dumpster then were accused of destroying civil war ordnance, go figure. 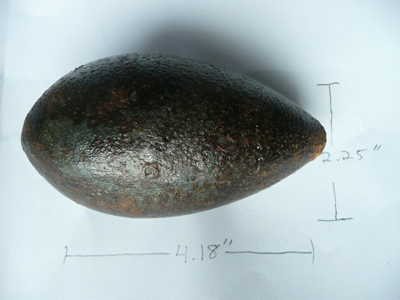 Civil war rifled bore projectile minus the lead sabot. Civil war ordnance- 1960 has a version with sabot and one without. I would add these pics but does let me. did anyone already had the idea to x-ray this object? what exactly are the markings on the brass screw? I believe the object to be an aircraft antenna weight. I have seen them before. If you go onto the Internet in put in "Aircraft Antenna Weight" you will find examples.